"Johnny Panic" is the third part in a trilogy (and the last film) of the British filmmaker Sandra Lahire inspired by the works of Sylvia Plath, namely her short story "Johnny Panic and the Bible of Dreams" from 1958. 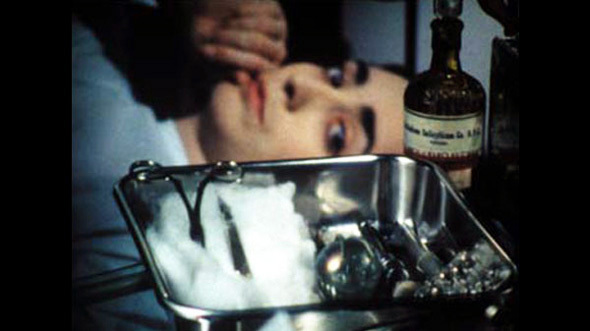 In the film, three of her fields of research come to a culmination while making visible the perverse character of the capitalist system: the ecological catastrophe and the uranium, leading directly to the atomic bomb; the (her own) anorexic body and corporality; and the performative aspect of gender, with the radical positioning of being lesbian, and at the same time a radical political persona. Hence, by contextualizing those contemporary forms of exploitation, and social and psychic submissions she creates the image of a world that will soon be in a state of constant panic. Sandra Lahire, who died in 2001 at the age of only 50 of anorexia, was a central figure in feminist experimental filmmaking of the 1980s and 1990s in Britain. During her study at St Martin's School of Art, London, she came in touch artists and filmmakers including Malcolm Le Grice, Lis Rhodes, Isaac Julien und Sarah Purcill. Her films have been shown nationally and internationally at cinemas and festivals.